Aberdeen are back at Pittodrie for the first time in three weeks as they face Motherwell on league duty. The Dons will be looking for only their second win of the season and first at home, which would put them in good stead going into Tuesday’s Betfred Cup Quarter-Final at Easter Road. Last Saturday the team fought back to draw 1-1 at St Johnstone and they face a Motherwell side also looking for their second win of the league campaign. Motherwell currently lie in 9th place, two points adrift of The Dons having picked up four points from five games. Last week Hearts extended their lead at the top of the table after a 1-0 win at Fir Park and Stephen Robinson’s men face the same opponent on Wednesday in the Betfred Cup. On Thursday lunchtime Derek McInnes and Joe Lewis spoke to the media ahead of Saturday’s match at Pittodrie. “We’re used to winning and a draw feels like a defeat at this club now and there’s nothing wrong with that. A draw against Rangers, a draw away to Easter Road where we lose a late goal and a draw at McDiarmid, each draw isn’t a bad result in isolation, but when there’s consecutive draws in a short period of time then the perception is we need to be winning more games. We do and there’s no getting away from that, but it’s not anywhere we’ve been before. We’ve had a couple of seasons where we’ve been in exactly the same position as we are. “It’s one we’re looking forward to and getting some points on the board and moving up the league table. It’s early in the season so there’s no panicking yet, but we want to get some points on the board and get some more wins. We’re looking to do that against a difficult team. Motherwell proved to be difficult opponent last season as they dumped The Dons out of both cup competitions in convincing fashion. The first meeting came in September in the Betfred Cup Quarter-Final where an unbeaten Aberdeen visited Fir Park for the first of two encounters between the sides in three days. Unfortunately for The Dons they were blown away by the rampant hosts and a 3-0 win sent The Steelmen onto Hampden. The team had no time to feel sorry for themselves as they were back in Lanarkshire on the Sunday for the league. 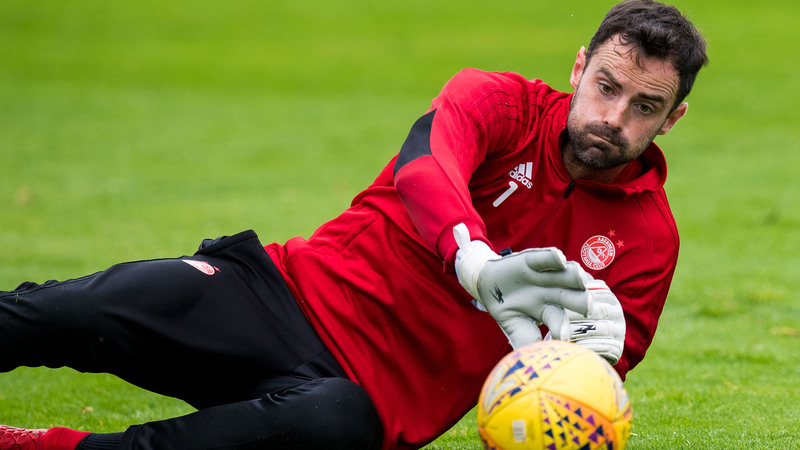 The Dons side was much changed and in came the new centre half pairing of Kari Arnason and Scott McKenna and it proved to be a masterstroke by Derek McInnes. The football was hardly a match that will live long in the memory, but Andy Considine bundled home in the second half to give Aberdeen the points in a disciplined performance. 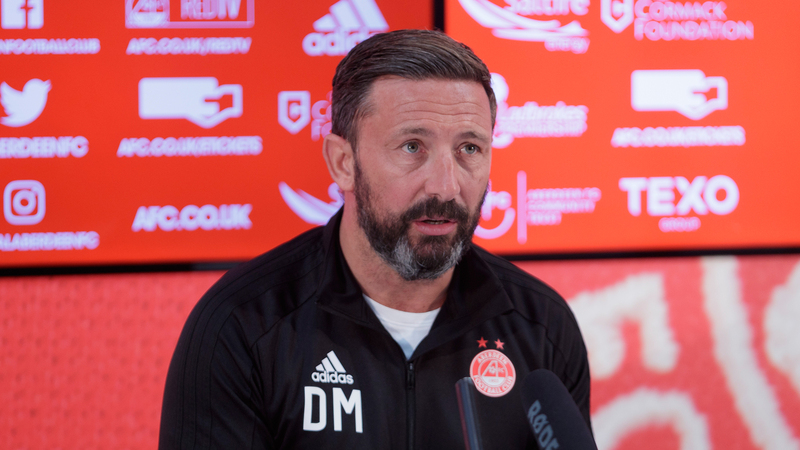 November proved to be a difficult month for The Dons and Motherwell came to Pittodrie looking for a win to prepare them for the Betfred Cup Final the following week. Once again Louis Moult struck with an excellent double against the lacklustre hosts ensuring a second victory of the season over Aberdeen. With the wintry weather hitting the country back in February, there were no surprises to see the third meeting between the sides postponed. The rearranged fixture in April took place only eleven days before the sides would meet in the Scottish Cup Semi-Final at Hampden so was seen as a dress rehearsal by many. The Dons certainly didn’t see it that way as they looked to strengthen their ambitions of finishing second once again. Two quick goals in the second half from Kari Arnason and Kenny McLean ensured the points would be going up the road, much to the delighted of the travelling Red Army. Unfortunately for The Dons they couldn’t replicate that performance at Hampden and were downed 3-0 for the second time in the cup competitions. It was an extremely disappointing day for the team as Motherwell won the physical battle which ensured The Dons would not be returning to face Celtic in May. Saturday will mark the 132nd league meeting between the sides at Pittodrie and it’s The Dons who hold the better record. There have been 64 victories for the men in red compared to Motherwell’s 22 and with the points being shared 45 times. The biggest victory for Aberdeen came in 1979 as Alex Ferguson’s side geared up for the following week’s League Cup Final with an emphatic 8-0 drubbing. In recent seasons the victories have swung in the favour of both teams. Under Derek McInnes, The Dons have won five league meetings and lost three with the points being shared just the once. Two seasons ago The Dons inflicted a 7-2 thumping over the Fir Park side with Adam Rooney netting a hattrick in the process. In Derek’s first season at the club, Motherwell won twice at Pittodrie including a controversial 1-0 on the final day to take second place in the league. If you can’t make the match on Saturday, then make sure to tune into our RedTV coverage from 2.45pm. We will have special guests Mark Reynolds and Scott Wright on commentary and international viewers will be also able to watch live video coverage. Post-match we will have reaction, goals, highlights and a full match replay. Aberdeen won their second league game of the season thanks to James Wilson’s goal in the 6th minute. Making his home debut, the Man Utd striker latched onto a Niall McGinn through ball and produced a great touch and finish. Coming into the match Stephen Robinson’s Motherwell sat two points adrift of The Dons. Last season the fixture proved unpredictable, with both sides exchanging victories across the course of the season as the sides met five times, including in both of the cup competitions. It was a great team goal and no surprise McGinn was involved again – the Northern Irishman has now been involved in ten goals in his last 9 games against Motherwell (four goals and six assists). 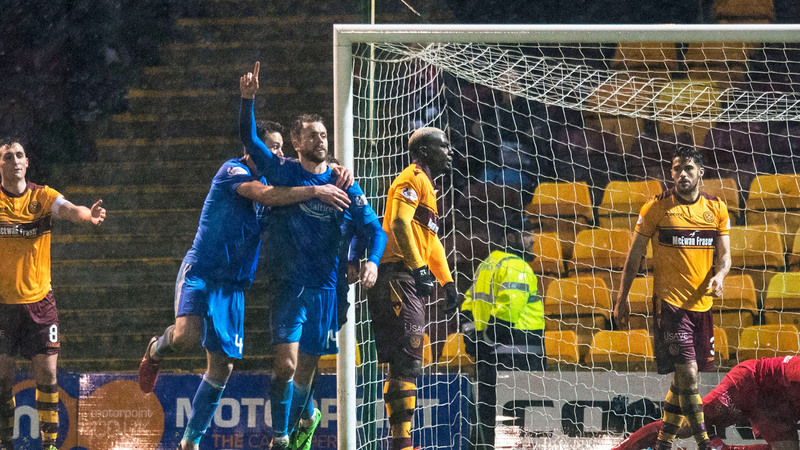 The effort had Motherwell rejuvenated and they were beginning to find their feet in the game after a quick start from the home side. They had a penalty appeal waved away after Elliot Frear got in behind The Dons defence – Andy Considine had to make a last-ditch tackle which the referee deemed fair and signalled for a corner which eventually came to nothing. At the other end, Shay Logan did well to win a free kick in a dangerous position for The Dons on the right-hand side of the penalty area. Both GMS and McGinn stood over the ball but it was the latter who hit it – McGinn’s effort had Carson scrambling across his goal but the ball had too much swerve on it and curled out past the right-hand post. Cosgrove went close just before the break. A good counter attack following a Motherwell corner, saw the striker get on the end of McGinn’s cross but he couldn’t direct his header on target. Tom Aldred became the first player to go in to referee Nick Walsh’s book for a late challenge on Cosgrove. The big striker had the afterburners on and was travelling at speed before the Motherwell defender brought him down and received a deserved yellow card as The Dons looked to break. That was the last action of a first half which was fairly comfortable for the home side but with only a one-goal advantage the visitors were still in the game. Out came the teams for the second half and Aberdeen looked to replicate their explosive first half start in the second. GMS looked lively down the wing and forced an excellent challenge from Tait to win an early corner. Devlin got on the end of the set-piece but he couldn’t divert his header goalbound and Motherwell cleared. Just after the hour mark, McInnes made his first change of the afternoon – goalscorer James Wilson making way for Bruce Anderson. The Manchester United loanee received a well-deserved standing ovation from 14,000 Dons fans inside Pittodrie. GMS nearly doubted the advantage in the most unusual circumstance. The winger did well to cut inside from the right-hand side and get an effort on goal. He didn’t quite catch it cleanly but Carson made a hash of it and the ball went straight through him. Fortunately for the Motherwell keep the ball trickled agonisingly wide of the far post and spared the goalkeeper’s blushes. Motherwell offered a late charge to get an equaliser. A bouncing ball in the penalty area had Dons fans hearts in mouth, the danger wasn’t cleared and Elliot Frear went down in the box. All eyes looked to the ref but thankfully for The Dons he opted to book Frear for diving rather than pointing to the spot. In the final few moments Joe Lewis pulled off a magnificent fingertip save to deny Cadden and deny Motherwell a point. Lewis was equal to Cadden’s effort from the edge of the box, sticking out a strong left hand to tip the ball around the post. From the resulting corner, McKenna bravely headed out and away and won a free kick for troubles.